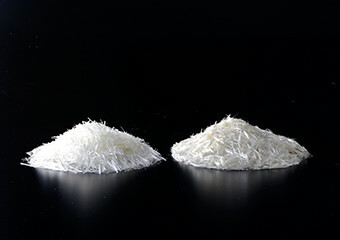 Chopped Strands | Nippon Electric Glass Co., Ltd.
ARG Fiber contains 17% of zirconia, and has both acid resistance and alkaline resistance at high levels. It is mainly used as reinforcement for Glassfiber Reinforced Concrete (GRC) and Calcium Silicate products. It is also used as crack control material for normal concrete and cement mortar. For more than 40 years, it has been widely applied in construction and civil engineering fields. Chopped Strands are produced by cutting strand bundles, which are made of 50 to 200 fine ARG fiber filaments, into various length. It is used as reinforcement for Glassfiber Reinforced Concrete (GRC), Calcium Silicate and Slag Gypsum products. It is also used as crack control material for normal concrete and cement mortar. Its high alkali and acid resistance can be applied to glass fiber papers and filters. ※The above values are only advisory, not guaranteed values.